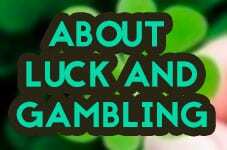 The hot hand in gambling - is luck responsible for winning or losing? There are many gamblers that tend to believe in what’s known as the hot hand. Few and far in-between are the gamblers that have given up on luck. But what is the hot hand all about? Is there such a thing? Or it’s a logical fallacy? Read more about it below. If you want more news and articles, check out the Viking Blog. The nature of luck – whats the hot hand? The nature of luck is to be treacherous. Sometimes you will be lucky, yes. You will win hand after hand after hand. And you will rack up the money. Everything will feel as if it’s the way it’s supposed to be. You will feel like you’re in the zone. There’s nothing to stop you from getting the money. Win after win after win. You go back home glowing thinking that you have somehow cracked the system. Somehow you know that the same thing will happen the next time that you gamble. But then you’re in for a cold shower of a surprise the next time you’re in the casino. This time, you’re not winning. Instead, you’re losing – hand after hand after hand. Nothing can help you to win something. But foolishly you continue, thinking that the winning hand that will redeem your losses comes on the next turn. But it doesn’t. And you lose a lot of money. And you feel like nothing’s right – as if Lady Luck has abandoned you for the night. What gives? Are these phenomena real? Well, by all logic, they aren’t. They are just blind manifestations of the concepts of randomness and luck. This means that sometimes you will hit it big and win multiple hands in a row. But the flip side of the coin is also here, too. You will also lose a number of hands from time to time. The thing to note here is that most of the times, you will be in-between these extreme ends of the spectrum. There is no such thing as “luck”. There is no such thing as the “hot hand”. Most gambling games aren’t based on skills – but on randomness. They don’t remember the past and can’t predict the future. You will be much better off to understand gambling for what it is. It’s a game based on randomness. You will win some and you will lose some. Furthermore, you’re likely to lose more than you win due to the fact that the house always has the edge. So, keep this in mind when gambling and you will do fine.